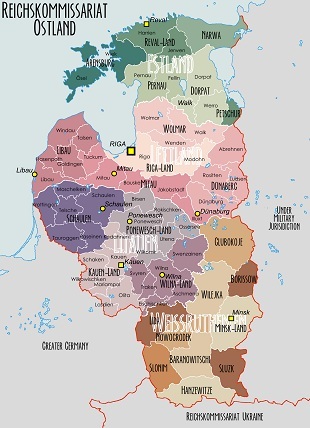 The German occupation of the Baltic states, portions of Eastern Poland, and White Russia (Belarus) in 1941 created the German Reichskommissariat Ostland, or the State Commission of the Eastern Land. This territory, after an initial period of military occupation, was that of a civil administration, nominally under the authority of the Reich Ministry for the Occupied Eastern Territories. The main political objectives, which the ministry laid out in the framework of National Socialist policies for the East, were the complete annihilation of the Jewish population, the settlement of ethnic Germans in the territory, and the expulsion of the native population. Throughout 1943 and 1944, the Soviet army gradually recaptured most of the territory in their advance on Germany, but Wehrmacht forces held out in the Courland Area. With the end of the war in Europe, the Reichskommissariat ceased to exist completely, and these occupied states again became part of the Soviet Union. 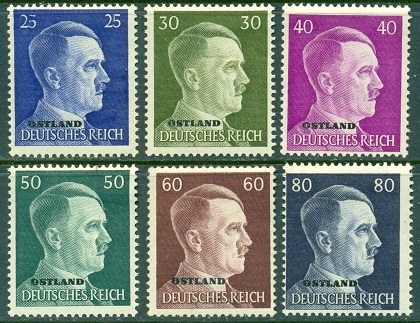 After November 1941, German Hitler definitive postage stamps, overprinted "OSTLAND" were used in the territory. The complete set is shown in the scan above (Mi. #1-20, Sc. Russia #N9-28). No noteworthy variations of these issues, other than the vending machine coil combination pairs, are mentioned in the Michel catalogs. The set is priced at 9 Euros for mint never hinged condition and 16 Euros for used condition. Thus one can COMPLETE the wartime issues for Ostland, including the coil pairs, for a very minimal investment! 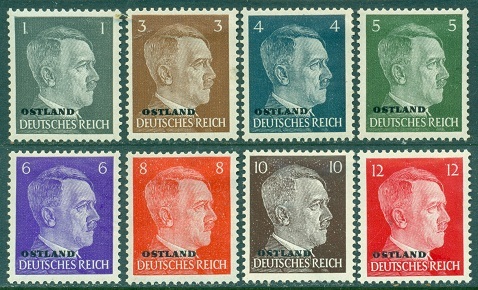 The same booklets and booklet panes made for the regular German postage stamps of this issue also exist with the "OSTLAND" overprint. Vertical vending machine coil combination pairs of the 4 Pf. and 6 Pf. denominations exist in several formats. 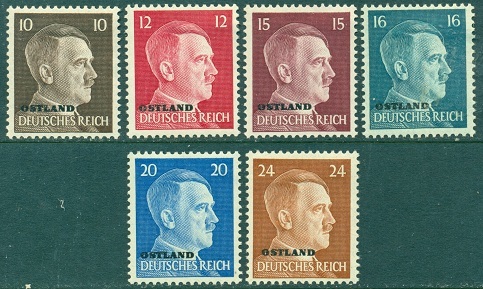 Mint never hinged condition examples, in vertical pairs or vertical strips of three are cheap. Used condition examples are a lot more expensive. Mint examples of the 15 Pf., 20 Pf., 30 Pf., and the 80 Pf. exist in pairs with one of the stamps missing the overprint.